Kells Music is proud to welcome Derek Warfield to our family of artists. His decades as a beloved figure on the world music scene and legions of dedicated fans make him a personality with few equals in today�s Irish music circles. A word very frequently used in reference to Derek is legendary, everyone at is Kells Music proud to have him among our ranks. Derek has kept the Wolfe Tones tradition alive into the new century with this new release. The touching ballad �Take Me Home To Mayo� was recorded as a duet with famed Irish American recording artist Andy Cooney. It is the perfect touch on this album that focuses on the musical and lyrical legacy of the colonial rule in Ireland. These songs and ballads express a great deal about the social, political, and literary force�past and present. And no one can bring them to life like Derek Warfield. 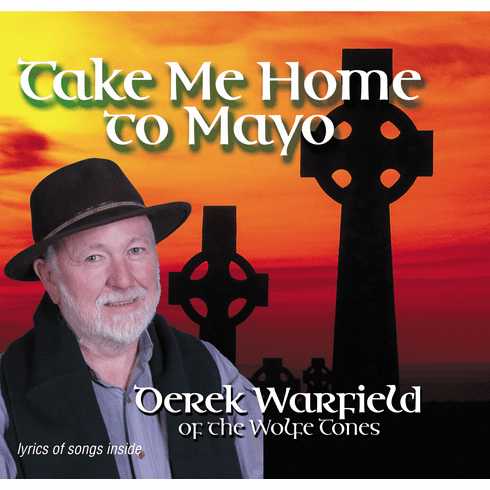 We stock and distribute a full range of Warfield recordings from the early Wolfe Tones days to the to fine Kells Music releases of today, �Take Me Home To Mayo� and �Clear The Way�.